Do you like your snowmen made of ice or sand? Winter will soon be upon us, yet I know the only snow I’ll see here in Houston will be settled at the bottom of a globe on my mantel. And I kind of like it that way. 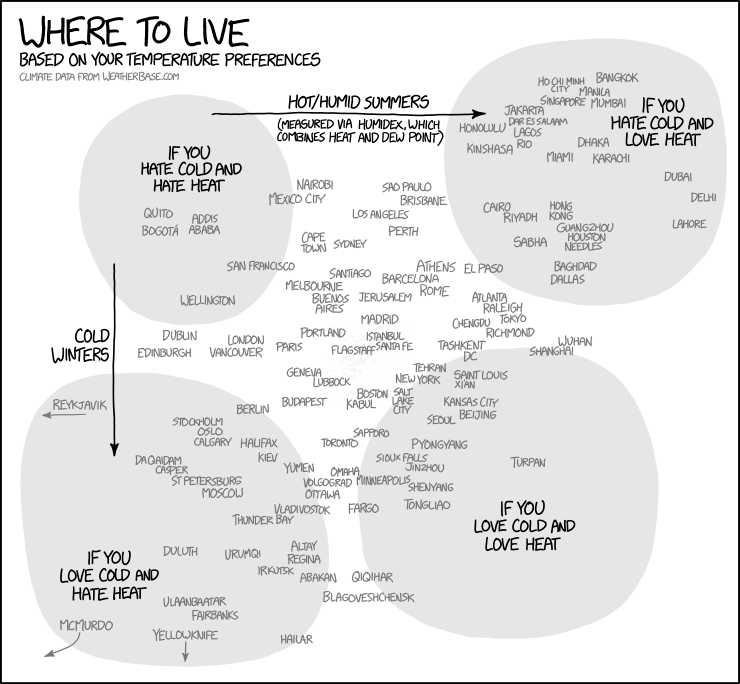 According to Randall Munroe, creator of webcomic website xkcd, I’m in the right place: Houston is the perfect city for those who prefer heat over cold. Dallas, Miami and Honolulu are also ideal for those who prefer to stay toasty (almost) year round. If cold is your thing, Casper, Wyoming (where winters are freezing and summers top at 88 degrees) is the place for you. Check out Munroe’s flowchart to see more cities broken down by temperature norms.